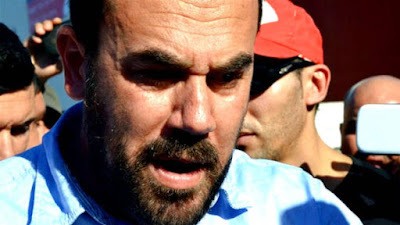 The jailed leader of a Moroccan protest movement, Nasser Zefzafi, has sewn his lips together after losing an appeal against a 20-year prison term, several sources said Tuesday. “Nasser (Zefzafi) has chosen this way of protesting to express his attachment to his freedom and to denounce reinforced security control” in prison, the inmate’s father Ahmed Zefzafi told AFP. A lawyer for Nasser Zefzafi said he had sewn his lips together, along with a fellow jailed protester. “Detainees Nasser Zefzafi and Mohammed al-Haki have stitched their mouths in protest”, lawyer Mohammed Aghnaj said in a Facebook post. Prison authorities did not comment on the protest action, contacted by AFP. Leaders of the Hirak protest movement which rocked Morocco in 2016 and 2017 on Friday had their sentences upheld by a court of appeal in Casablanca. Zefzafi was convicted on charges of threatening state security in June last year. The social unrest was sparked by the death of a fisherman and spiralled into a wave of demonstrations demanding more development in the neglected region. Authorities accused the activists of having separatist aims.